FORT LAUDERDALE/DAVIE, Fla. – More bad news for sharks. When the researchers began to gather, compile, disaggregate and review the data, the results were startling. 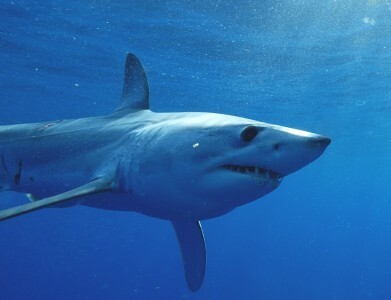 The tracks of the tagged mako sharks, including the ones captured, can be viewed online on NSU’s GHRI shark tracking website (nova.edu/sharktracking). Globally, many shark species have seen significant declines in their numbers, with fisheries over-exploitation cited as a major cause. This can happen in many ways – some shark species are specifically targeted while others are captured by accident (called bycatch.) No matter how sharks are taken from the world’s oceans, the fact remains that the current levels of removal for many species are unsustainable. The researchers stress that the work they are doing has the goal of providing the most accurate information possible to those in positions to take action to manage mako and other shark species. They both say that the goal is create successful fisheries management and conservation – to avoid declining populations, and to do that, we must have as much accurate data as possible.